Learn about the WS-Security Transport Binding Policy. The "WS-Security Transport Binding Policy" is used when the message protection is provided by the transport medium. A common usage scenario is using HTTPS as the message exchange transport medium. In a transport binding assertion, a transport token can be defined where messages can be contained and then exchanged only through a defined medium. WS-Security policy specification defines a HTTPS token that defines messages be transmitted over HTTPS. In the second panel, click Modify to access the Modify WS-Security Transport Binding Policy wizard. In page 1, Specify Transport Binding Options, enter values for the binding options. For details about fields and values, see Specify Transport Binding Options below. Click Next. In page 2, Specify HTTPS Token Options, enter values for the token options. For details about fields and values, see Specify HTTPS Token Options below. Click Next. 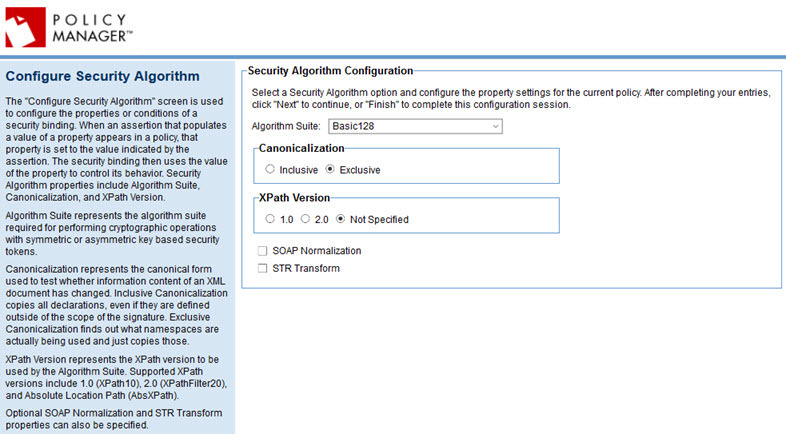 In page 3, Configure Security Algorithm, specify the security algorithm and associated settings. For details, see Configure Security Algorithm below. In page 4, Specify WS-Security 1.0 Options, specify security options. For details, see Specify WS-Security 1.0 Options below. In page 5, Specify WS-Security 1.1 Options, specify security options. For details, see Specify WS-Security 1.1 Options below. In page 6, Specify WS-Trust 1.0 Options, specify trust options. For details, see Specify WS-Trust 1.0 Options below. In page 7, Specify Security Audit Options, specify audit options. For details, see Specify Security Audit Options below. The Specify Transport Binding Options page includes the options listed below. Specify the WS-Security Policy version. Versions 1.1 and 1.2 are currently supported. Indicates that the timestamp should be included in the transport binding. The Specify HTTPS Token Options page includes the options listed below. Allows you to specify an IncludeToken attribute in the message. Choices: Not Specified, Always, Once, or Never (Indicates that an external reference mechanism is used to refer to the key represented by the token). Check the box if the policy should require a client certificate. The subject category for the token. Choices: Consumer, Service, End-User, User Defined, or None. For user-defined, specify the value. The Configure Security Algorithm page includes the options listed below. For more detailed information about the algorithm suites supported, see Supported WS-Security Algorithm Suites. Allows you to select the canonical form used to test whether information content of an XML document has changed. The default, Exclusive, determines which namespaces are actually being used and just copies those. You can set this field to Inclusive, which copies all declarations, even if they are defined outside of the scope of the signature. Indicates the XPath version to be used: 1.0 (XPath10), 2.0 (XPathFilter20), or Not Specified (the default). Checking the box indicates that SOAP normalization is turned on. Checking the box indicates that the STR Transform property is set to STRT10. The Specify WS-Security 1.0 Options page includes the options listed below. Indicates that no WS-Security 1.1 options are specified. This is the default. Indicates that the specified options will apply to the policy. Allows you to specify that Key Identifier References must be supported. Allows you to specify that Issuer Serial References must be supported. Allows you to specify that External URI References must be supported. Allows you to specify that Embedded Token References must be supported. The Specify WS-Security 1.1 Options page includes the options listed below. Allows you to specify that Thumbprint References must be supported. Allows you to specify that the Signature Confirmation property is set to true. Allows you to specify that the Encrypted Key References property is set to true. The Specify WS-Trust 1.0 Options page allows you to configure a set of properties supported by WS-Trust 1.0 when the Trust10 assertion is part of the Endpoint Policy Subject. It includes the options listed below. Indicates that no WS-Trust 1.0 options will be specified in the policy. Allows you to specify that client challenges must be supported. allows you to specify if server challenges must be supported. Allows you to specify that client entropy is required. Allows you to specify that server entropy is required. Allows you to specify that issued tokens must be supported. Captures all message data, whether success or failure, for all message exchanges. If you choose to generate audit data, you can specify that audit data is captured only when an error occurs on a message exchange. To use the policy, go to the Policies folder in the Root Organization and attach the policy to a web service, binding, or binding operation.